There’s something incredibly refreshing about an ice-cold beer, no matter what time of the day it is. But gone are the days when you’d drink every single beer in the same heavy bottomed mug or glass. No sir, not anymore. The last few years have seen good old beer going from being a casual, feel-good drink to a gourmet experience. 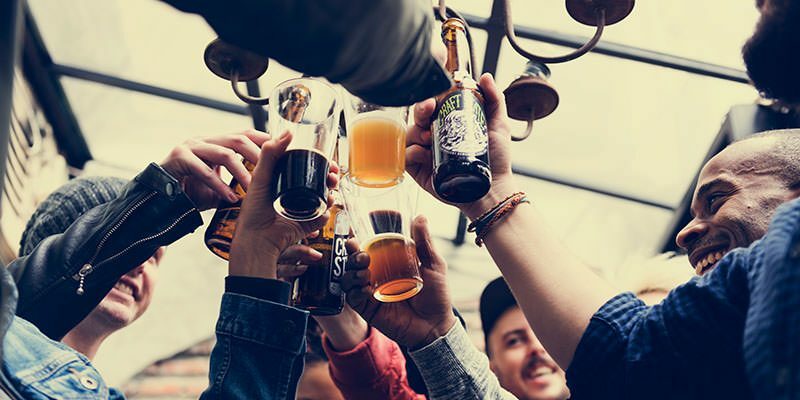 Craft beers have seen rising popularity with the millennial generation, with microbreweries innovating with their beers in terms of different grains, hops and brewing processes. So if you are still drinking beer in those heavy-bottomed mugs, and feeling good about it, believe it, you’re missing out on a lot. Beer drinking isn’t about chugging a few pints anymore – it’s what expert brewers call an ‘artisanal experience’. In other words, beer has now achieved the same status as wine – there’s a particular way of drinking a particular kind of beer, and it is almost a ritual of sorts. Just like you’d never serve champagne in a goblet, or merlot in a flute, there are some kinds of beer you only serve in some kind of glasses. Among all the different kinds of artisanal beers flowing freely from the tap, there are a few that are more popular than the others, and among these stands the Indian Pale Ale, or as it is popularly called, IPA. What Is an IPA glass? How to Choose an IPA Glass? IPA is a specific kind of pale ale that first gained popularity around the 18th century. A pale ale is essentially an ale that has been brewed from pale malt. IPA was brewed for the traders by the East India company traders by one George Hodgson. The brewery that made this ale was located near the East India Docks. Eventually, demand for this particular exported style of pale ale grew and hasn’t stopped growing since. Essentially, an IPA is a more intensely hopped and stronger version of Pale Ale. It tastes strong, flavorful and still refreshing, making it one of the most popular craft beers in the world today. Just like you would have with other kinds of alcohol – be it champagne flutes, brandy snifters and cocktails glasses, there’s the right kind of barware to use when drinking IPA. And it just isn’t about IPA looking good in a specific kind of glass. As with wine, there are specific reasons why IPA is served in one kind of glass and not others. So then, what is an IPA glass, and what makes it so unique? An IPA glass is specially designed to create a ‘head’ of beer or foam that makes for a decadent beer drinking experience, and release the aromatic compounds of the IPA, resulting in a sip that is creamy, refreshing, and full of flavor. For this reason, IPA glasses have a special shape, which allows them to keep the beer colder, and retain the aroma and flavor of the beer for a long time. If you take your beer seriously and want to make sure you get the best out of every sip of your IPA, you’re going to need an IPA glass that is just right. How do you pick the best glass for your IPA, and what do you look for when making this choice? An IPA glass is a specific shape – it is tall enough for you to pour your beer so as to create a thick, creamy head of foam, but narrow enough to trap the aromatics. The mouth of this glass is in the shape of a bowl, which allows you to savor the aroma and complex flavor of the beer uniformly. A good IPA glass has an etched bottom, and this isn’t purely a branding aspect. Creating texture by etching the bottom of the glass allows for carbonation to happen at the bottom of the glass, incorporating air into the beer and drawing out and amplifying all the nuanced flavors of the beer, while also giving you a pleasant, refreshing sip. Similar to a wine glass, an IPA glass also has a wide bowl, that allows you to sniff and inhale the aromatics. As it goes with any barware, durability is an important factor in deciding the quality of the glass. Usually, durability is associated with the thickness of the glass, but with an IPA glass, the walls have to be thin enough to not absorb the coldness of the beer, and keep it chilled for longer. This is a classic IPA glass from Spiegler, a trusted brand of beer glasses. With its beautiful, perfect shape and wide mouth, it allows you to savor your beer right down to each last drop. Wide mouth allows you to inhale the aroma of the IPA. Unique bowl shape amplifies aroma. Narrow, tall shape creates creamy, fuller head. Ridged sides aerate the beer as it flows. Thin walls keep the beer colder for longer. Thinner walls make this less durable. You can buy a set of Spiegelau IPA glasses at Amazon. A great deal for the money that our editors love, Spiegelau brings you not one, but two IPA glasses, perfect for an afternoon of chilled beer with your best buddy. With its unique shape and beautiful look, not only is this one of the best ways of relishing your IPA, it is also a fantastic addition to your bar. When it comes to beer, as they do with wines, Italians clearly know how to drink it in style. These IPA glasses from Luigi Bormioli are no exception. They are designed, in every way, to give you that perfect IPA experience, from your first sip to last. Unique formula creates a durable, long-lasting glass. Specially designed shape controls the pour, creating a richer head of beer. Base comes with foam control system. Laser-etched design on the base optimizes carbonation and aroma. Made of lead-free, high-quality crystal glass. Slightly more expensive as compared to other brands. You can buy the Luigi Bormioli IPA beer glass at Amazon. 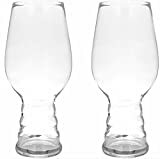 For a set of two IPA glasses, this set is only slightly expensive as compared to other glasses our editors compared, but nevertheless a great choice if you are a lover of ale and believe in drinking your ale the way it ought to be drunk. This set of IPA glasses is just perfect. Priced much lower than the other brands we compared, yet impeccably designed – these IPA glasses from Òodzoo are perfect for the beer enthusiast who would much rather save on glasses and spend on the beer instead. One of the cheapest IPA glasses in the market. Perfectly designed shape for maximum aroma and flavor. Tall shape gives you the perfect pour and rich head. Does not have a wide bowl shape. The set of IPA glasses from Òodzoo is available for purchase at Amazon. Priced affordably for most beer drinkers, this set of IPA glasses is easily the most value-for-money product on this list. If you’re someone who loves their craft beer in style, but prefers not spending too much, these glasses are the perfect choice for you. You also don’t have to worry about using them too frequently – they’re durable and sturdy. While they might not have a particularly unique design, they serve the purpose well, giving you the perfect sip of your IPA each and every time. If you still aren’t convinced about the difference that a specially designed glass makes to your beer-drinking experience, you absolutely must give the IPA glasses a shot. Once you find yourself indulging in a richer, more flavorful and refreshing experience, you’ll never again pour another pint of India Pale ale into a regular glass. As a true beer connoisseur, you deserve to get the most of your beer, from the foam to the last drop you drink.